This is the third in a series of blog posts about celebrating Earth Month by exploring the history of renewable energy on Martha’s Vineyard. A commitment to renewable energy is leading the community of Martha’s Vineyard toward a more sustainable future. The island’s local businesses, non-profits and municipal organizations are central to the effort, using innovative solar design to help power the island’s commerce. South Mountain Company (SMC), a local integrated architecture, engineering, building and renewable energy firm, has worked with several of the island’s business organizations on innovative solar design, including converting retired landfills to solar power stations, building solar parking canopies and affordable solar housing. In total, SMC has installed roughly three megawatts of residential and commercial solar on the island. Cronig’s Market is a century-old Martha’s Vineyard grocer that’s committed to eco-initiatives that reduce its environmental impact. Cronig’s engaged South Mountain to design and construct solar parking lot carports, a highly visible demonstration of the market’s commitment to green business practices. South Mountain designed and built solar canopies with 210 kilowatts of SunPower® solar technology and six electric vehicle (EV) charging stations. 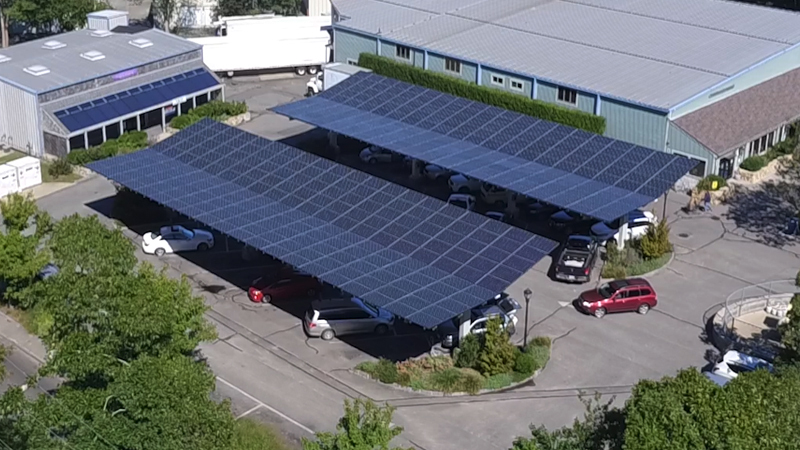 "A parking lot is an already-distressed landscape that serves a single purpose, but with solar canopies, you make the lot a power generator and provide shade and protection from rain and snow,” said John Abrams, founder and CEO of South Mountain Company. 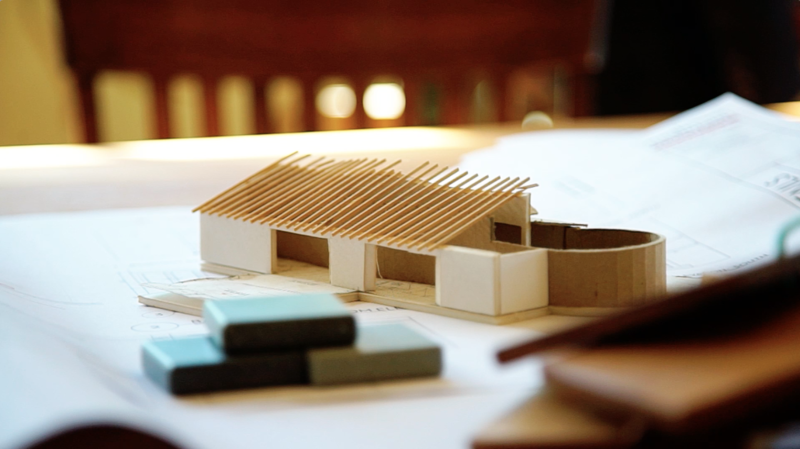 Multi-use structures optimize the use of limited space and are key to Martha’s Vineyard’s commitment to clean energy. After the success of the first canopy installation – a collaboration with Vineyard Power – Cronig’s hired South Mountain to build another solar parking canopy at their second Martha’s Vineyard location. Affordable housing is another essential priority for Martha’s Vineyard; several community organizations are working together to develop good solutions. South Mountain collaborated with a non-profit, the Island Housing Trust, to design and build eight LEED-platinum certified homes. Known as the Eliakim Way neighborhood (pictured at top), the homes incorporate solar to become a net zero community, thus stabilizing energy costs and meeting the project’s environmental goals. “Truly affordable housing must have low energy use and low maintenance exteriors, so ongoing operating costs are manageable,” Meyers said. The Eliakim Way neighborhood is designed to be a net zero community, which means each home can produce as much energy as it consumes, thanks to the combination of high-performance design, construction and rooftop solar installations. “With SunPower, we were able to install the necessary capacity in a smaller area and preserve additional space for future solar thermal or solar PV expansion,” Meyers said. To achieve net zero energy, the homes are also outfitted with energy saving features such as high-performance windows, careful air sealing and heat-recovery ventilators, which work together to maximize the home’s energy efficiency. “When you add solar to that, it’s a fabulous pairing because it fixes most or all of the cost of energy for that family,” Meyers said. With all eight homes functioning at or near net zero energy, the Eliakim Way neighborhood is an example of affordable housing in an area with very high real estate values. The solar horizon is bright for Martha’s Vineyard. South Mountain is studying the feasibility of powering a portion of the island’s public transportation system with electricity generated by solar energy. The project is just beginning, and SMC’s design and engineering experts are assisting in the effort to discover what’s possible, practical and scalable. When the right solution is created, Martha’s Vineyard will likely not be the only place to benefit. Perhaps if Martha’s Vineyard’s public transportation system goes green it will become a model for other towns and cities in the United States, offering a cleaner, more economical alternative for commuters across the country. The island is already leading the way with future-forward solar initiatives, inspiring and reminding us that every day is Earth Day, and that we really can change the way our world is powered.